“Do you like it?” I asked, as little Elaine eagerly took the sea lettuce from my outstretched hand and popped it in her mouth. She chewed thoughtfully, opening her mouth so I could see her teeth every time she bit down, fully exploring the odd new texture. 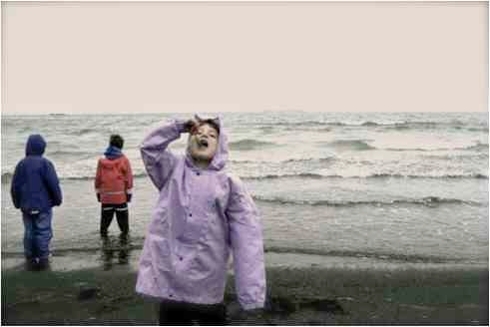 Then she swallowed and a serene expression came over her sea-sprayed face: “Miss Leila,” she said, as salt water dripped from her eyelashes, “I just want to stay on this beach forever and eat seaweed.” Elaine hugged herself within her purple rain jacket and turned to look out at the wind-whipped ocean. It was a picture of wildness and beauty, and it made me feel really alive—kind of like the feeling you get in the moment you decide to embrace the rain and just get soaked. I couldn’t have wiped the grin off my face if I wanted to as I turned to look at the other children playing along the beach and picked up a new handful of sea lettuce. I swirled it in the surf to rinse it of sand and walked down towards the little rain-dancing rain-boots with my handful of salt-soaked offerings. Officially my job title at the Kodiak National Wildlife Refuge is “Park Ranger,” which is both a really poor sum-up of my actual position and kind of a misnomer anyways when you work for the Fish and Wildlife Service, with is quite different from state or National Parks. When I describe my job to other people I tell them I am the Youth Conservation Corps crew leader at the Kodiak National Wildlife Refuge (KNWR), and that I lead a team of four high school students in projects both in town and out in the field that benefit the Refuge and the Kodiak community and educate the high schoolers about the National Wildlife Refuge system and the many things that KNWR does to fulfill its mission to conserve and protect the Kodiak Brown Bears and their beautiful archipelago habitat. Which is all grand and well, but when I really think about what this summer experience is meaning to me, three words come to mind with which I would describe myself: teacher, learner, explorer. I love teaching and working with younger children, and one of the best parts of my job is that when I’m not working with my four high school crew members (they work part-time and I work full-time), I also get to work with the Refuge’s other environmental education programs, such as Salmon Camp, a week-long day camp program that runs all summer for different age groups, which gets kids outside and engaged with nature and teaches them about the Kodiak ecosystem. This is the camp I was working at on that beautiful, blustery beach-day that I decided to show the campers about edible seaweed. Salmon Camp has been an annual program at the Kodiak Refuge for almost twenty years, and I attended it every summer when I was growing up. It’s the reason I could name you all five species of Pacific Salmon in my sleep and probably know the anatomy of a salmon better than I do a human (I’ve never dissected any humans…). There will always be a special place in my heart for “The Salmon Song,” about the life cycle of a salmon, and for the fond memories I have of fishing in the river beside my friends. 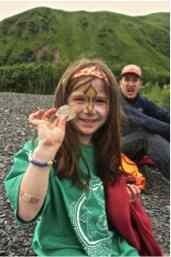 Part of what makes teaching at Salmon Camp so fun is that I know what I had fun exploring and learning about when I was little, and I so I can really relate to their discoveries and experiences. By now you are probably thinking, “wow, what’s with all the salmon! ?” but to me a salmon is a symbol of home and an incredible example of the glorious wonder that is this perpetually-changing existence we call life. Salmon are big, and fat, and slippery, but they start out as tiny eggs no bigger than a pea. Salmon, when fresh, are a most delicious exception to my vegetarian diet. Salmon, after growing big in the ocean, return to spawn and die in the exact same stream in which they were born. 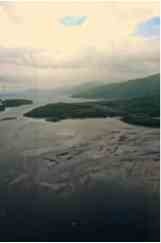 Salmon are the life-blood of the Kodiak community and the six smaller Native village communities around Kodiak Island. 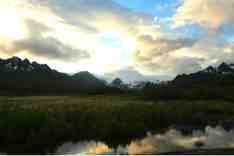 Salmon have fed people on Kodiak Island for thousands and thousands of years. The native people of the Kodiak Archipelago are the Alutiiqs (pronounced al-oot-ick), and their subsistence culture and respect for the land serve as a valuable example of how life really should be lived. Before the Russians arrived in Alaska in the 1700s, the Alutiiqs were scattered in settlements all around the Kodiak coast, however nowadays there are only seven year-round communities on the archipelago: the town of Kodiak (population 7000ish + a the largest Coast Guard base in the country) and six native villages (population 100ish-300ish). Along with day camp in town, throughout the summer Salmon Camp also holds two-day camps in all of the villages for kids of all ages to participate in, and this week I got to go on one of the first village trips of the summer, to the community of Old Harbor on the south end of the island. From town, you can’t get to any of the villages (or actual Refuge land for that matter) without taking a bush plane or a boat, so on Tuesday morning I packed my sleeping bag in my favorite purple dry-bag and by ten o’clock found myself sitting in a little six-seater airplane (we hitched a ride on the mail run) flying over Kodiak’s bays and glaciers, and probably bears, winging my way to Old Harbor. Half an hour later we landed and headed into town set up camp in the bingo hall/community center and were ready by one for the twenty-one eager little faces that enthusiastically joined us in tide pooling, nature-journaling, and playing games and reading books about the ocean habitat. I said before that I would describe “learning,” as one of the duties of my job. I would also say this about life in general, but what is so great about working a job that you really love, as I do working for the Refuge, is that your job itself constantly produces new learning opportunities. Even though I grew up in Kodiak, before my trip to Old Harbor I had only been to one other village, for a short trip with my Girl Scout troop when I was eleven. The trip to Old Harbor gave me a new perspective on the many different ways of life that all coexist on this beautiful Alaskan island that I call home. 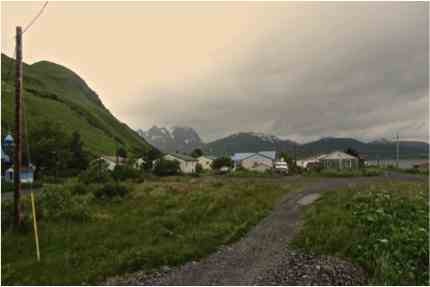 Being in a village, even more so than being in Kodiak town, gives a person a real sense of the immediacy of nature and the reminds you of the fact every single one of us is intimately connected to the Earth through the land we live on. Your life and my life are like small, sparkling treasures found on the beach by a little girl with her face painted like a brilliant bald eagle while the eagles themselves fly above us all. By now I hope you have had a little bit of a glimpse into part three of my job, the part where I am an explorer and the part that is really the whole part. As cheesy as it is, Alaska really is the “Last Frontier.” In few other places in the world is the landscape still lush with wilderness and is living off of that land not only an option, but also really a way of life. As I flew home from Old Harbor I was reminded as I always am when I fly over Kodiak of the incredibly beauty and incredible power of nature. Looking down in one bay, I could see waves of red algae swirling beneath the surface of the water. Called a “red tide,” the presence of algae blooms like this in the water sometimes renders filter-feeding sea creatures such clams and muscles unfit to eat, and it’s a reminder that in order to live off of the land you first have to understand and respect it. 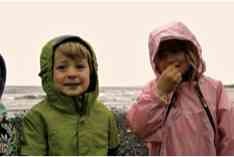 Although we have miles and miles of sandy beaches, you can’t dig for and eat clams in Kodiak. You can, however, eat seaweed. And spruce-tips, and sea cucumbers, and salmon berries, and salmon. Alaska is teeming with natural beauty, and as large and grand as it is, is nonetheless in need of our protection and stewardship in this harsh, industrial world. It is places like the Kodiak National Wildlife Refuge that stand as a testament to what environmentalists like myself still have left to fight for to keep this world as wild and clean and free as we possibly can, and that I simply have to fight for with all my heart and soul. Because before I ever described myself as an environmentalist, or even knew what that was (I’m still not really sure), I knew I was a Kodiakan. I knew I was an Alaskan. I knew I was a climber of spruce trees and a swimmer of oceans and a girl of all things salmon. I find beauty in a child with seaweed on their lips and I find beauty the fact that the sea-worn salmon spawning in the river by my house were born in that very same stream in the fall of some year past while I was busy climbing trees and picking salmon berries. This summer I hope that you find your beauty and find your connection to your land. Embrace it, get to know its nature, get to know its people, and even if you’re there for just a while, don’t ever be afraid to call it home. I fully believe that taking care of this Earth starts wherever you are exactly right now. You are on the Earth, and therefore you are in nature. Take care of what you love and it will take care of you (but also don’t forget to let it amaze you!). Peace, love, and salmon, from Kodiak, Alaska.